Welcome to the Map Showcase! The concept of this thread is simple: post a map for feedback, and or give feedback to others. If you want to get some quick feedback on one or more maps this is the place to do so. Try not to focus too much on small, easily-corrected mistakes such as tile errors. Feel free to bring them up, but they shouldn't be the focus of your feedback if there's something else to discuss. Hey! So I guess this is the first map to be posted on the map showcase! So just a bit of context... This is supposed to be a first town using the FR:LG tiles. However, it is in a desert which is not nice since there aren't too many desert tiles. So some advice in general is nice but I am also looking for advice on how to utilise the tiles better. Looks good overall but that orange rug/mat thing looks outta place to me. I think that the room looks solid as a whole with just a couple of weird bits. You have plenty of decorations to make the room look reasonably filled, and I dig the general color scheme of yellows, oranges, and reds that blend well together. Some people might argue about the bookcase covering the window. With the amount of stores and public builsings that do the same thing, I think that the bookcase's position is at least interesting and kind of convincing. I agree with Nebula that the rug is oddly placed; it gives the impression that the counter runs over it. I do not know the size of your characters in your game, but the PC in the corner is somewhat small compared to other objects in the room and could use a size increase. Additionally, I think that, while a helpful touch to flesh out the room, the wall shadows to the left and right don't look quite right with different widths. Hey guys! I come bearing a few old maps revamped a bit for use with my new plans for Aura. Many of these things are still very beta and/or placeholder (A.K.A the shrine rock thing in the forest), but I was wondering if anyone has any feedback that they notice right off the bat or even upon further analysis. Thanks in advance! 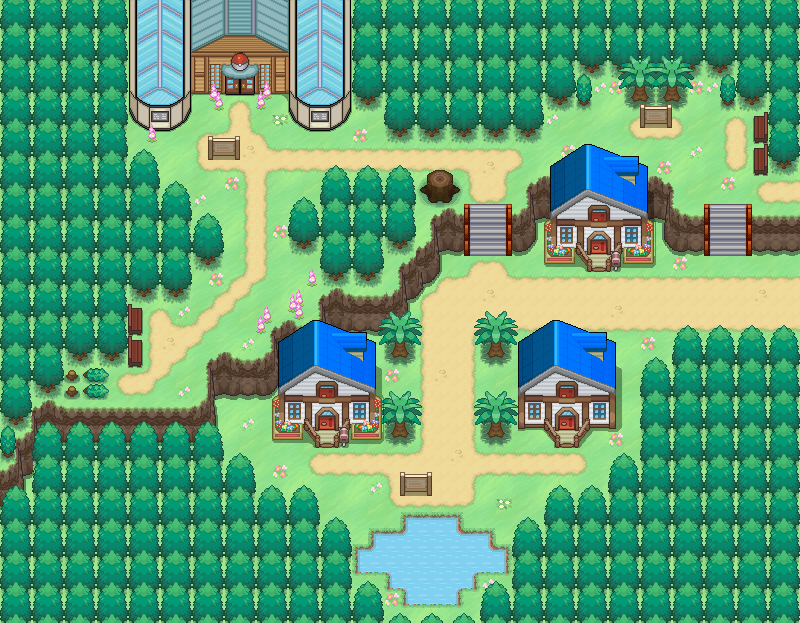 Second Map- Okay, so the only problem I can see with this map is that there is too much forcible grass, the player is forced to walk through quite alot of grass to progress and I think that would make it more of a hassle than a way to explore the Pokemon in the area. 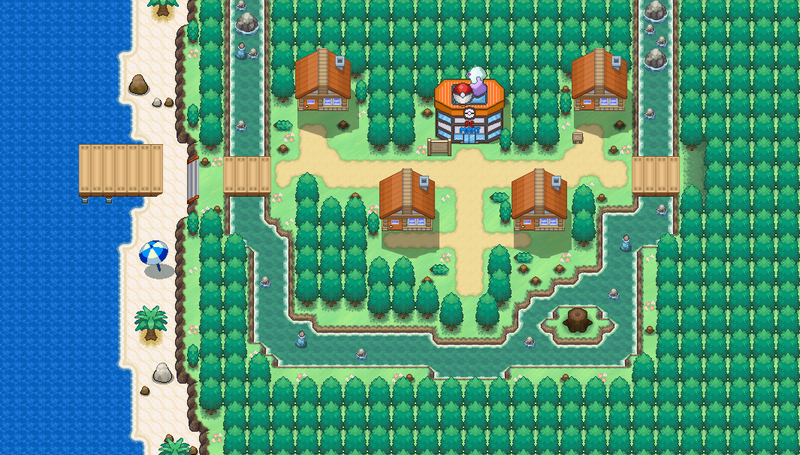 If there was some grass of the side then that gives the player a choice if he/she wants to find the new Pokemon or if he/she just wants to progress. I would just make the large patch a little smaller or maybe just break it up a bit. 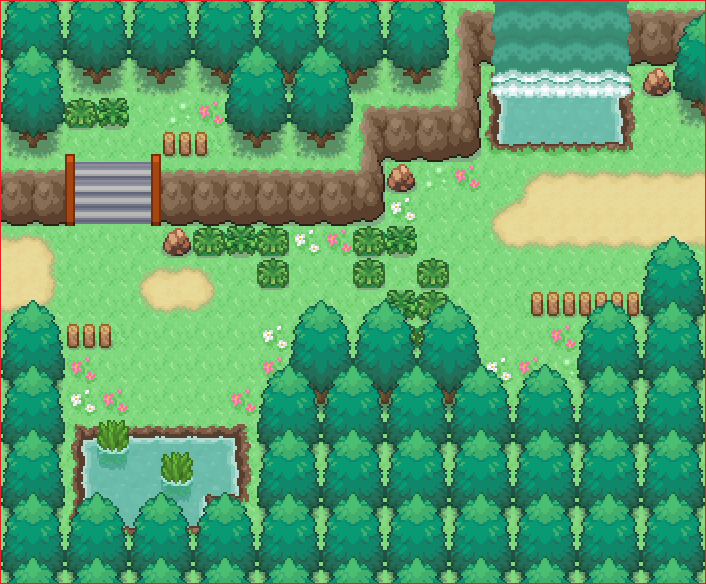 Third Map- I think this map looks really nice and I like how the river goes around in the horse shoe shape, that should definitely stay with the town(should you change it) the only thing is that I think it also lacks some natural plants/rocks. Some of those would make it look better. 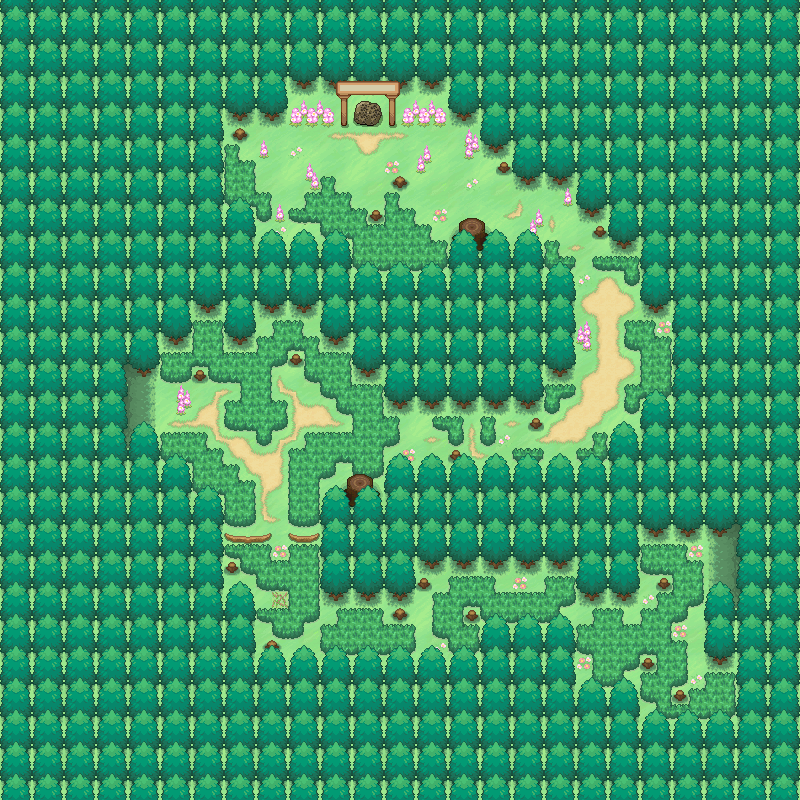 Fourth Map- This map is also really nice, but like the second one that had to much grass, I think this map may need more grass especially towards the shrine looking thing. I love the pathways and the way the grass is spread out and formed in unique shapes. 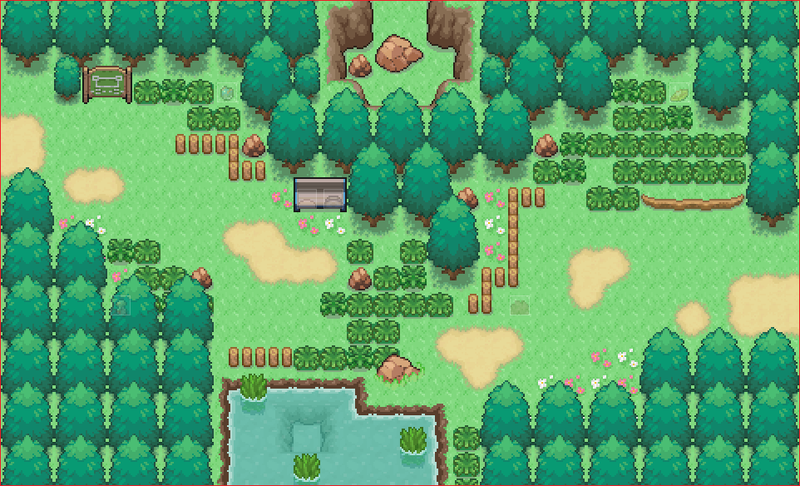 I don't know if you are using Fakemon but if you are then maybe put something that could be accessed at later game to maybe catch a special Pokemon/Fakemon near the top of the forest. 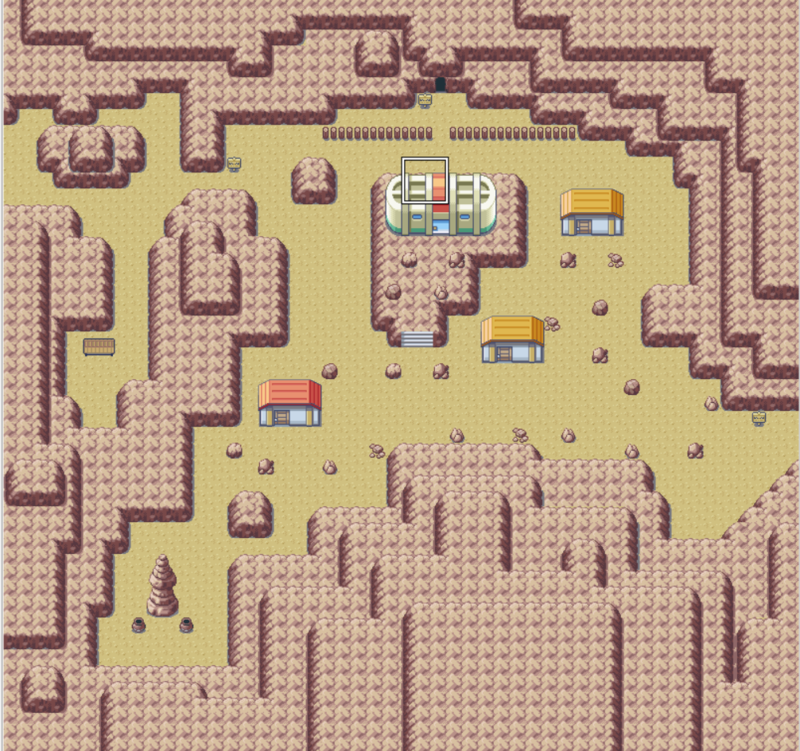 Anyways, now that I've done that, I have a few maps I have been working on. 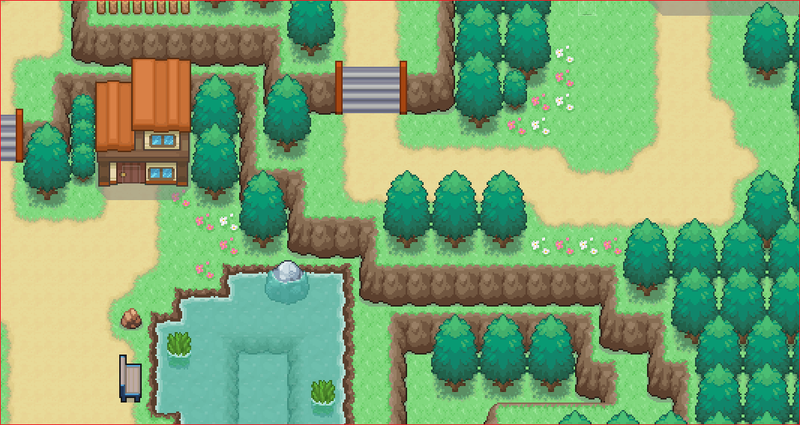 Also, just to remind you, I know that the Gym's Roof Tile is below the Tree(I fixed it in RMXP! ), I just can't edit the SS for now. There's not much change, pretty much similar. 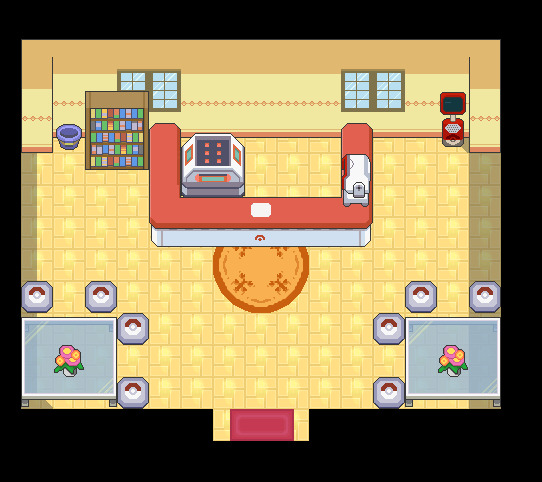 The Gym is just a lot bigger and I added a new house(and of course, the Tileset). 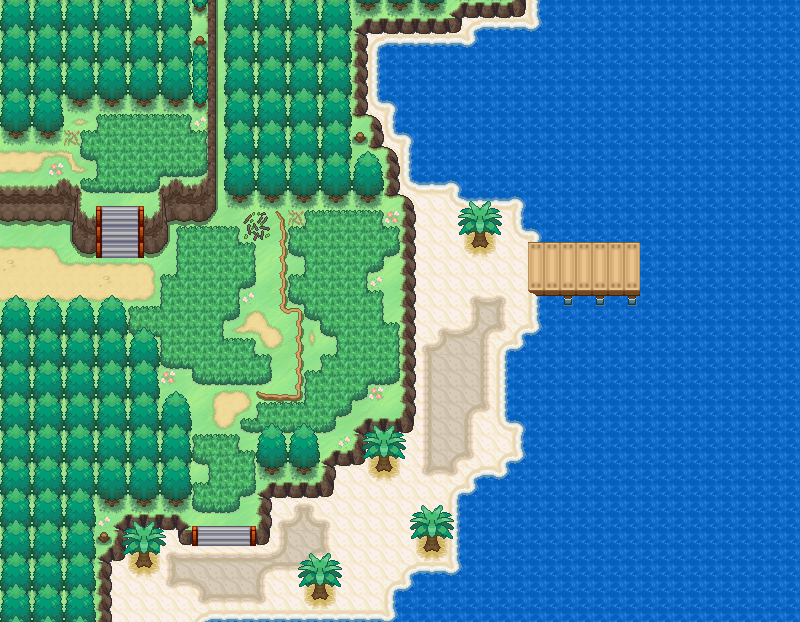 Recreating the official maps is a pretty good way to get mapping practice. 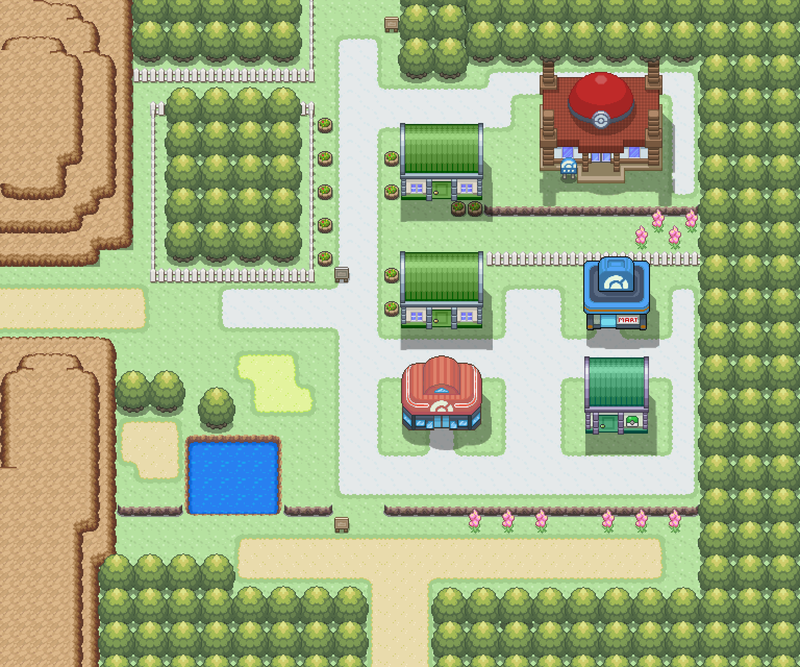 I'm not sure if you've done this or not, but perhaps you could try adding some new elements as you recreate the maps, or making a couple of changes here. 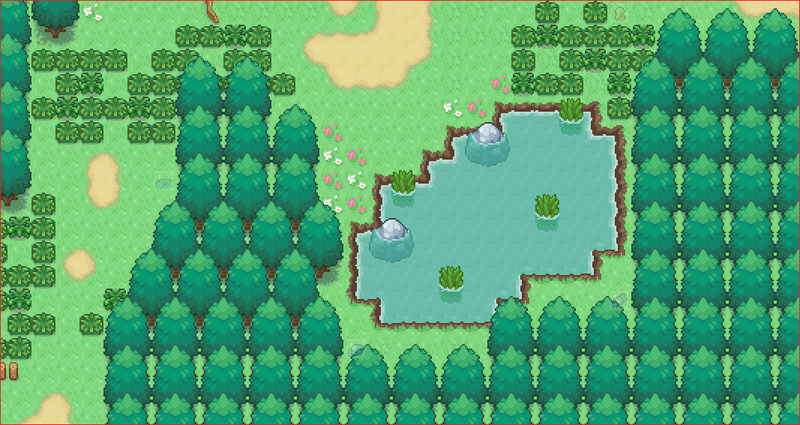 Like moving some of the buildings around, adding a pond or river, something to give it a bit of unique flair, as well as getting a bit more comfortable with mapping. That aside, I think they're looking pretty good! There are a couple of areas that do feel a bit empty, but for the most part I'd say they're pretty solid. Thanks for the feedback! I'll definitely work on that! Just one thing, for Route One, you do realize that the big grass patch is optional, unless you are talking about the somewhat smaller one? 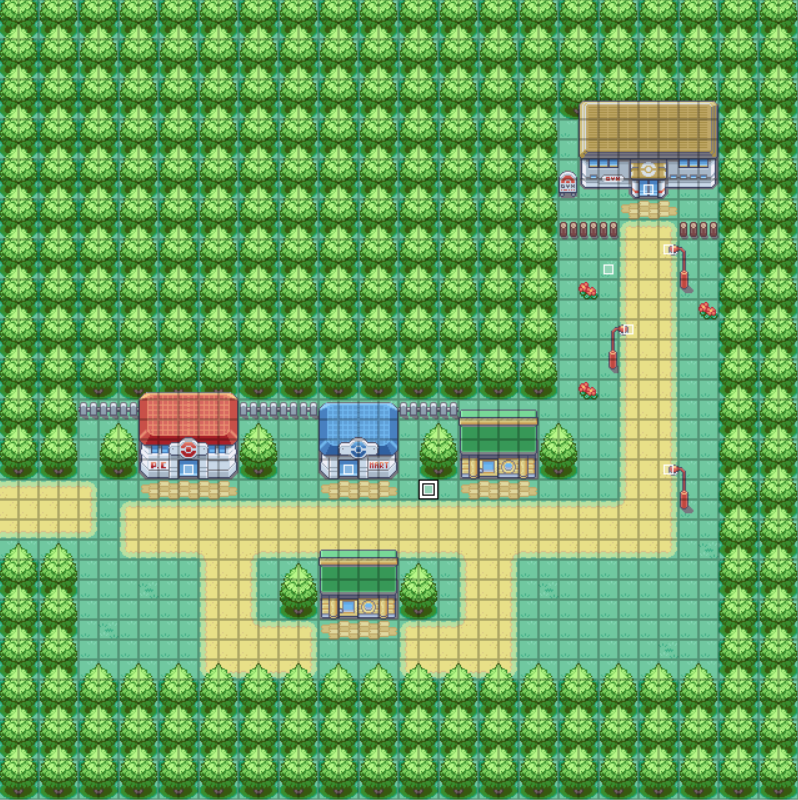 I was just trying to make it so that you would HAVE to encounter some Pokemon at some time. This map seems to have a good start. I like the idea of the second house being lower down. However, I feel like the corners are a bit too rectangular. Staggering your treeline could help smooth it out. Also, the gym is a little far away from the rest of the town. I'd suggest putting some things around it to make the walk to the gym more interesting. Maybe branch the street out a little, making use of the space behind the white fence. 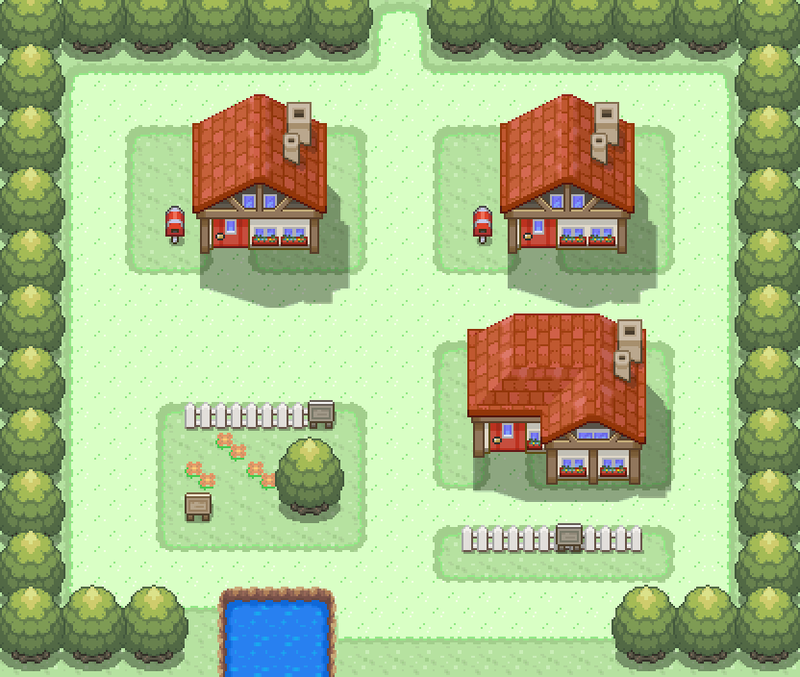 I feel like the town would look nicer if the brick road was used throughout the town rather than the footpath, and some mountain/hill tiles around the lowermost house could give the town some depth. Oh, and if you want to know how to take a picture of your map without the gridlines, I suggest going onto layer 1, 2, or 3, going into View, and deselecting Dim Other Layers. That way, you can see the full map without the gridlines. 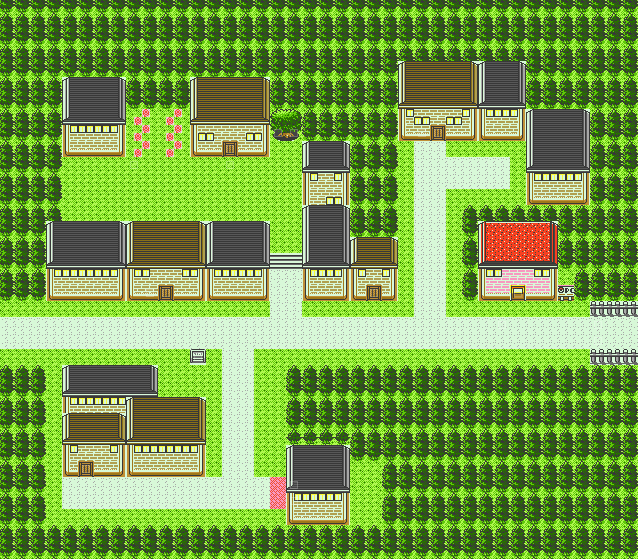 It's not that bad, but I do feel like it's a bit blocky and has a couple of wide open areas that could be filled in. 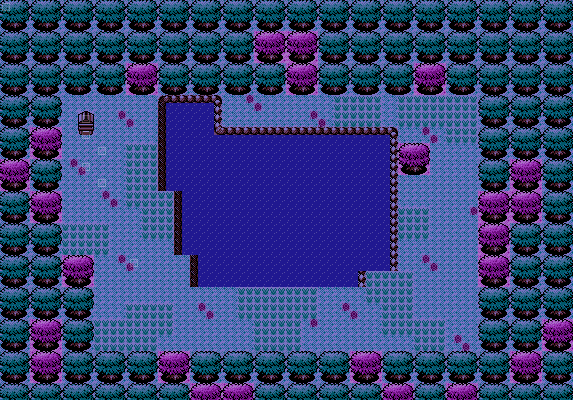 I think that I the layout of the trees is a bit angular and square, making it feel a bit unnatural. The two grassy areas on either side of the lower house are empty and could either be filled in with the trees, or filled in with something a bit more interesting. Helpful rule when mapping : always make sure the player can see something of interest no matter where they stand. You never want there to be a huge, empty, wide open space. Huh, didn't see that nobody had replied to you already. My only concern is that the top left corner might be a little empty. I guess some NPCs could help fill up that space. @FredLikesWater To be honest, there's not too much to say about the map since it's mainly just a building :P Out of what I can see though, I this the tiles are quite nice, and I rarely see anyone using them (which is kind of weird actually). I think I would add some little details to the grass such as flowers to add a bit of interest, because at the moment it does look a bit plain. I'd also change the way the trees have been done. 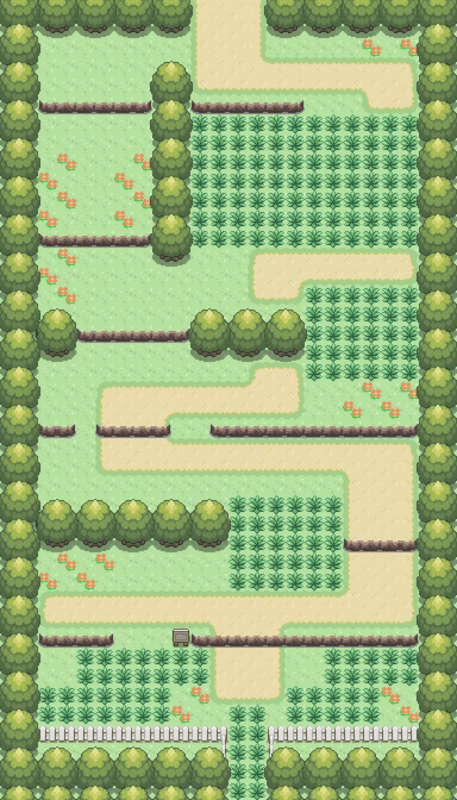 Normally, in Pokemon games, the trees touch each other or even join each other, giving the impression that the trees are really thickly growing next to each other. 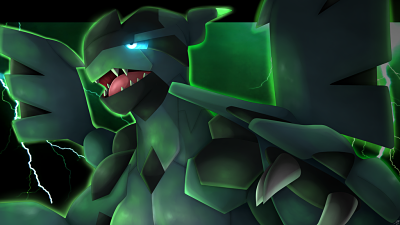 They way you've done them, I think it looks a bit odd compared to how they usually are done in Pokemon games.